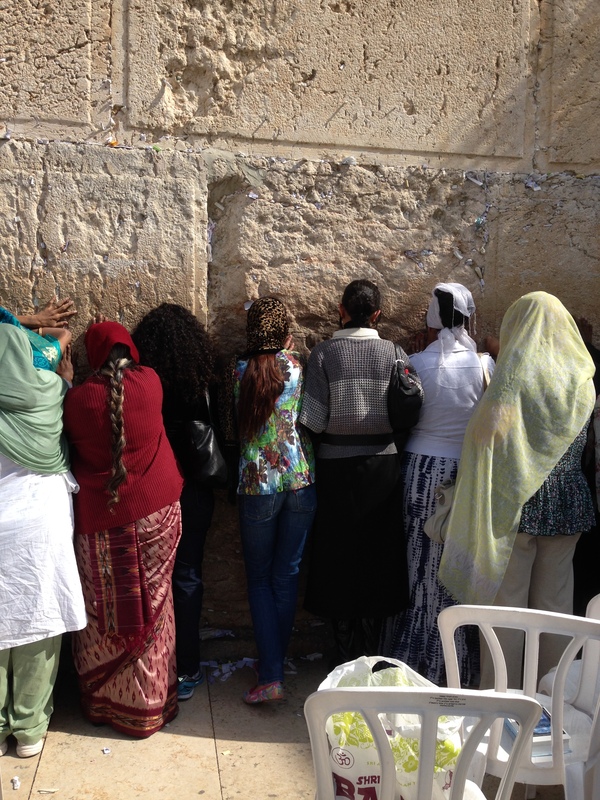 It was in March last year that I learned of Women of the Wall’s 25th Anniversary. I felt compelled to plan a trip. I and my congregants (and even my sister who joined us from NY) wanted to stand in support and celebrate with our Israelis sisters. It was in May that I learned that I was not alone. Rabbi Kedar and Cantor Frost were bringing a group from Chicago. Rabbi Robbins was bringing a group from Dallas. Week by week other clergy and other delegations would join in: Miami, Oakland, Los Angeles, Westchester, and Connecticut. It was in August that I learned that the Central Conference of American Rabbis and Women’s Rabbinic Network would be joining us with delegations. While we do not know how many Reform Jews have made aliyah since that day 45 years ago, we do know that in a most recent Israel Democracy Index for 2013, 7.1 percent of Jews identified themselves as Reform or Conservative Jews. With 110 Reform and Conservative synagogues in Israel, we are steadily growing. We are almost half a million strong and so we are here to say with our actions, prayers and advocacy that the time has come to make good on that promise. The time has come for mixed prayer at the Kotel. The time has come for women’s communal prayer at the Wall, not just one hour a month, but whenever women are moved to pray. The time has come for Torahs to be read by women at the Wall and for our daughters and granddaughters to become B’nei Mitzvah at the Wall. Most of all, in reflecting the diversity of Israelis and Diaspora Jewry, the time has come for choice at the Wall. Yesterday we lifted our voices in prayer and song. Today, tomorrow, and beyond we lift our voices in advocacy and action. Forty five years ago our mothers and fathers yearned to pray together at the Wall in gratitude for the reunification of Jerusalem. In the spirit of dreams of this week’s Parashat Vayeitzei , may our dreams of a Wall for all Jews with men’s prayer, with women’s prayer, and with mixed prayer be fulfilled. Now is the time. Last night, as I bought a candy bar at the Supermarket, the cashier said to me, “Chodesh tov – have a good month.” Even the cashier knew it was a new moon! As we kicked off the formal part of our International Mission to celebrate Women of the Wall’s 25th anniversary and to support pluralism in Israel, here are my words from the opening ritual. “Tonight we welcome the new moon of Kislev. Many of us have been counting the days, counting the weeks, and counting the months for this Rosh Chodesh to arrive. We were longing to be here in this city, to be here in this place, and to be here with these people. Each month we bless the new moon that is pregnant with light and pregnant with possibilities. Jewish mysticism connects the new moon and its increasing radiance to messianic potential. Increasing light casts out darkness of every form: hatred, discrimination, and inequality. Kislev is all about light as on the 25th of this month we will brighten the world with our Chanukiyot and follow Hillel’s instruction of nightly increasing the light we cast on the world. The Talmud teaches that a light for one is a light for one hundred. We are one hundred souls participating in these three Reform movement missions. Hence our light is a light for one thousand. Tomorrow morning at the Kotel as we celebrate Rosh Chodesh Kislev and Women of the Wall’s 25th anniversary, we could be one thousand people strong, thus making ours a light for ten thousand. As we tell our story and as it is told by others in person, in print, and on the worldwide web, we bring the light of the fight for women’s equality and religious pluralism in Israel to hundreds of thousands. Light reflects God. Light reflects Torah. Light reflects memory. Light reflects the soul of every human being and of humanity. Pitchu li, open for us the gates of song this week in Jerusalem. Pitchu li, open for us the gates of inclusiveness this week in Jerusalem. Pitchu li, open for us the gates of justice. Pitchu li, open for us the gates of acceptance and respect. Pitchu li, open for us the gates of equality. This week in Jerusalem, pitchu li, open for us the gates of peace. The Land of Israel is not a museum of God. No place is a museum of God, no person and no inanimate object is a thing of worship. It is permissible to both touch and change the things on the condition that you yourself are prepared to be touched and changed. You come to a place – a hill, the desert, a spring, a house…You change it and you make your mark upon it but, it is also important to be open and give it the opportunity to leave its mark on you. As the sun set on Jerusalem Thursday night, a group of thirty of us (including five rabbis and one cantor) stood at Montefiore Plaza overlooking the Old City and read this poem. 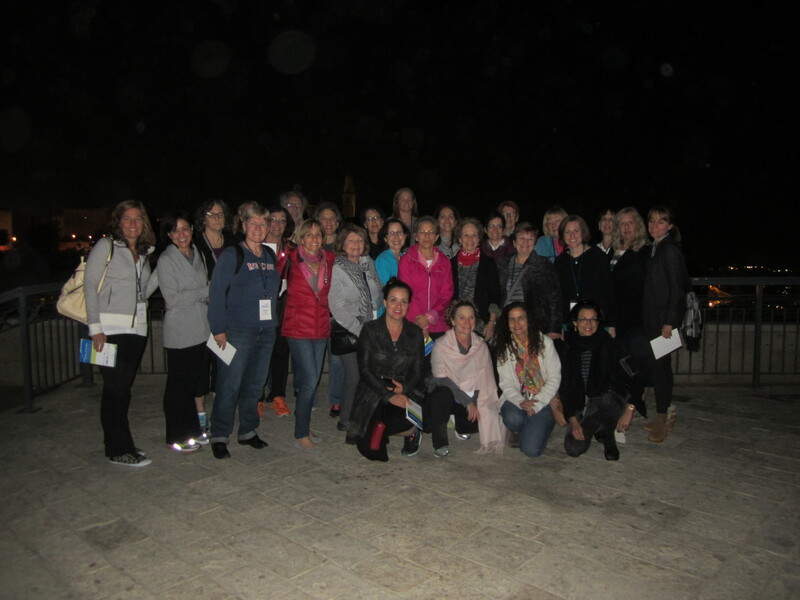 Tonight our group kicked off a mission to celebrate Women of Wall’s 25th Anniversary and to support pluralism in Israel. On Sunday, our mission will swell to over 100 including twenty eight clergy (with one brave male rabbi). On Monday, we will stand with many more hundreds at the Western Wall praying and working to influence Israeli leaders inspiring them to make Israel into a country that embraces the diversity of Jewish expressions and prayers. We will stand with the Women of the Wall who for twenty five years have battled for the right for women to pray together in talit and tefillin and to chant from the Sefer Torah. Their decades of labor are finally yielding fruits as it seems that after all these years a compromise solution is close at hand. We will learn more about this from Natan Sharansky and from Anat Hoffman, Chair of Women of the Wall, in the coming days. It is not enough to be touched by Israel but we must touch it. It is not enough to be moved by Israel but we must move it to become the holiest of holies that it can be.